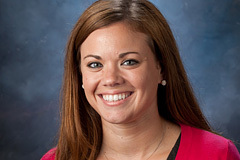 Allie is the Director of First-Year Admissions and has been at St. Ambrose since 2012. Her hometown is Moline, Illinois and she graduated from Alleman Catholic High School. My husband and I were married at Christ the King Chapel, so I have to say I'm a little biased toward it! Campus Ministry also is located in the lower level of Hayes Hall, and it has a lovely and quiet study spot out in the gathering space. Check out our BEE Finished in Four Years plan! It shows that St. Ambrose is committed to our students' success and helping you complete your undergraduate degree in a timely manner. The BEE Finished plan will help you graduate in four years or less, and if any coursework remains after four years, the university will waive tuition and fees for that coursework.